Taking shortcuts on your cattle nutrition during the winter months could risk next year’s calf crop, this year’s weaning weights and the long-term viability of your herd. According to information from university of Minnesota extension beef experts, winter feeding programs vary for each cattle enterprise. Winter nutrition for your cattle is vital. 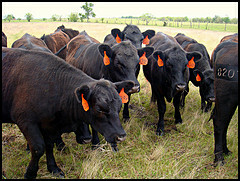 This entry was posted on Thursday, April 26th, 2012 at 5:47 pm	and is filed under articles, Cattle. You can follow any responses to this entry through the RSS 2.0 feed. Both comments and pings are currently closed.